Officially Anastasia, but Annie, Ana, Nes, Nessie for friends. Pick your favorite one or create your own nickname for me, I'm a large container! But I hope you will not call me.. Nasty. My ID card is trying to tell me that currently I'm 18 years old: the possibility of me agreeing with this statement depends on the day. I discovered some years ago that the best way of filling my free time is reading and sharing the marvelous act. So, yay, boredom has been successfully removed from my everyday life. I'm not English, I'm a citizen of that country often remembered for unforgettable delicacies like pizza. So, you will excuse me for possible grammatical oversights, right? How often do we tell our own life story? How often do we adjust, embellish, make sly cuts? And the longer life goes on, the fewer are those around to challenge our account, to remind us that our life is not our life, merely the story we have told about our life. Told to others, but—mainly—to ourselves. Tony Webster, an average exponent of the human race, looks back on all his life in order to understand what was really going on not only with himself, but regarding above all the others. The narration is sometimes lucid, sometimes uncertain, unreliable like every distant memory could be remembered and lightly transmuted, even if only in the details. 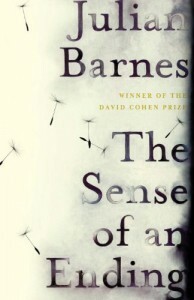 The first part is the flashback: the times in high school when he met a significant person in his life, Adrian Finn, an incredibly smart boy who defined the history as "that certainty produced at the point where the imperfections of memory meet the inadequacies of documentation" when asked by his professor, when Webster could only give legendary answers heard from others and not entirely believable even for him, just to say something without being dull; the times of college with his girlfriend, Veronica, whose bookshelf is full of Auden, T.S. Eliot, MacNiece, Stevie Smith and others. But there's a difference: Tony knows that Veronica's books are consumed for her readings, while his books are consumed only because he has bought them in a second-hand bookstore, leaving them there in order to read them one day or another. And then, the free months after college and the "mature" age with her wife, Margaret. These two last parenthesys are brief, because Tony's doubts and question are concentrated on Adrian and Veronica, who will come back violently in his life when a letter will pop up in Tony's mailbox. The themes of the novel are so eloquent that it is impossible to not stop and think of all the intellectual provocations about life and time. In what measure can we be different from the Average Man, Tony Webster? there was the possibilty to not feel the mature age as a silent deception, if compared to the paths of glory of teenage years, when the future was a promise and larger and greater than the past years? At the end, I believe that most of what happen to us is deserved. Particulary our deceptions, which are the result of our choices. But sometimes this is a tough statement to accept, so memory will forge our past, will neglect those details which will not match with our dramatic romance. And like I said, the more I read the novel, the more it turned into a subte journey throught the forgotten details. And this tale about reconstructing the truth is engrossing, at the end totally unpredictable. Its characters have those opacities of not truly known persons and fill Tony's life with the unpleasant stains of a realistic middle life. Actually it's such a realistic representation that it got under my skin. A tracing paper on the second and third layers of life. I definitely will read more by Julian Barnes.